BugDoc Dave here with my monthly Stretch Tuesday article! Tonight, I’m going to cover some of my favorite small items, creamer and sugar sets. I like these items because they are small and don’t take up much shelf space. It appears that only the major stretch glass companies made these sets and they didn’t make very many forms. However, when you consider that they may come in a wide variety of colors, one could make a decent collection of these items. In keeping with our shorter format, I’ll just discuss the sets made by Fenton. As far as I can tell, they only made three forms, but one form can come with a plain or diamond optic interior. The first set is the Fenton #2. 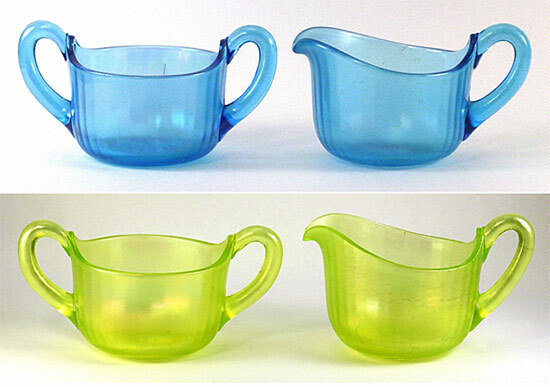 These items are blown-molded and they have applied handles. Because of this, the bowls and handles are usually of different colors, but cobalt blue was most commonly used for the handles. 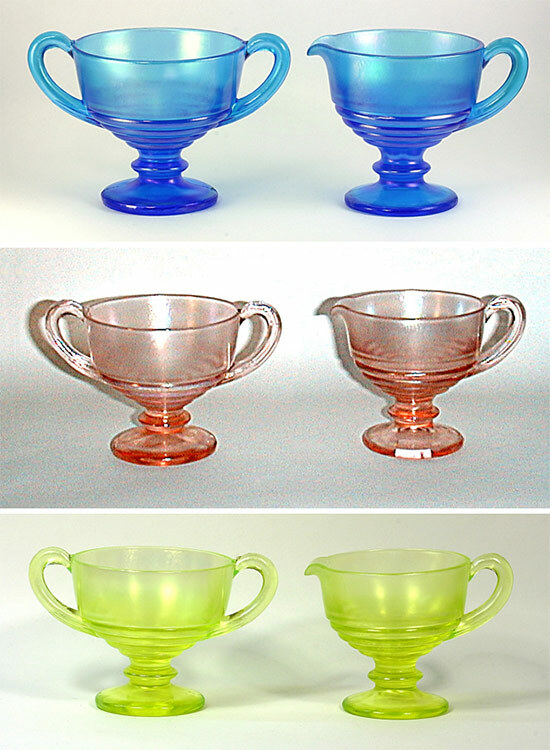 These items come in most of the Fenton stretch colors, but Celeste Blue, Florentine Green and Grecian Gold are the most commonly found colors. Here is a rare Tangerine set. Notice that the handles are also in tangerine. The Fenton #3 creamer and sugar sets are the most commonly found forms, but getting a set is no easy task. These are press-molded forms and they have a nicely designed pedistal base. These are most commonly found in Celeste Blue, but Velva Rose and Topaz are fairly easy to obtain. When the #3 mold was used with a diamond optic plunger, the items become the #1502. Getting these in a set is very difficult! 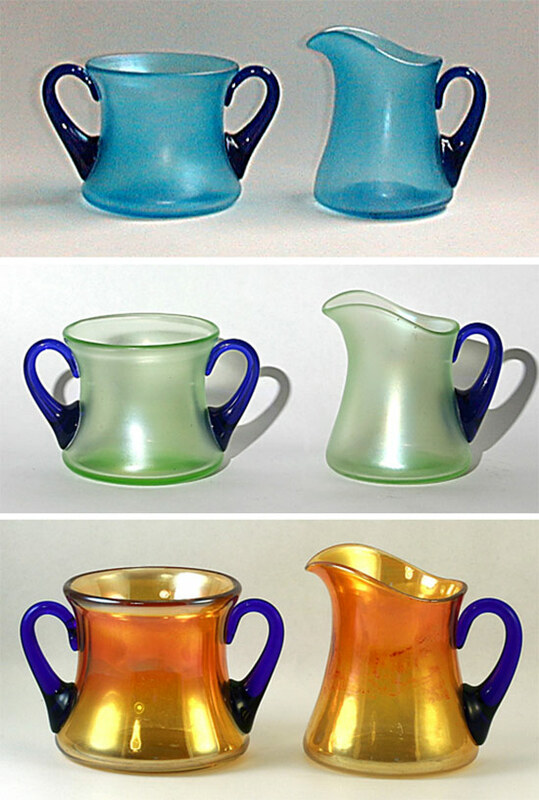 The last form of Fenton creamer and sugar sets is a press-molded type, but these have ground bases (in other words, they were ‘stuck up’ to be finished, not snapped). The bowls have narrow optic ribs. I only know these in Celeste Blue and Topaz. Getting a set without flakes on the rims is nearly impossible! Happy hunting! !